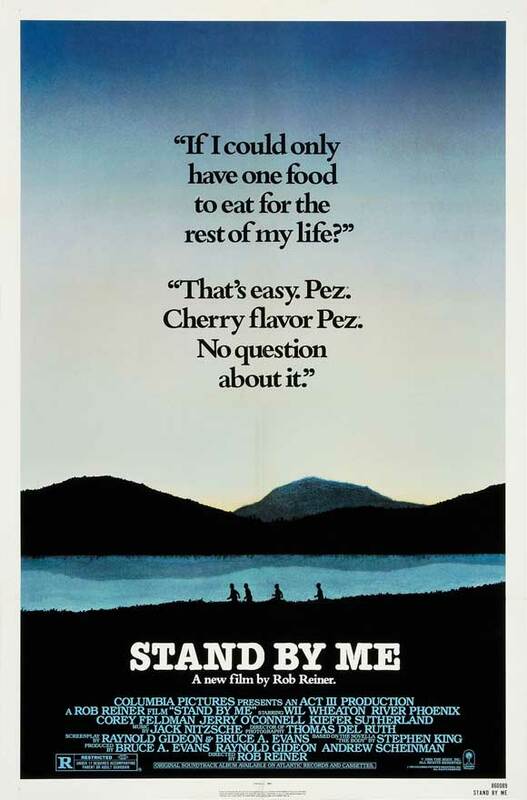 Stand By Me. Act III Productions 1986. I mainly know of this movie because it was apparently the biggest thing in Wil Wheaton’s child acting career besides Star Trek, and as I keep up with his internet presence, it comes up a lot. I only know the broadest strokes of the plot, that there’s a group of boys who have some kind of adventure that leaves them all changed, like The Goonies, though more mundane. Everything else I think I know comes from the Simpsons episode that I think is based on this. I’m not normally drawn to coming of age films, as I’m neither young enough to appreciate them as a child nor old enough to absorb the nostalgia of childhood adventure. Indeed, I’m from after the era where children commonly wandered freely outside of school to make lasting friends and life-changing discoveries, so this kind of film is somewhat foreign to me. But I have the impression that it’s a classic from the mid-80s, even if it doesn’t have as strong or visible a cult following as many others. Four twelve-year-old boys learn that the body of the kid that went missing recently is out near the tracks way farther than the search parties have been looking, and set out to see him and then achieve fame by being the ones to find him. Gordie’s golden boy older brother recently died, Chris has a reputation as a thief, Teddy’s father snapped from the pressures of the war, and Vern’s father is a violent drunk. Walking 20 miles out of town, they all have to come to terms with their hardships. But Vern and Chris’s teenage brothers and their friends, who found the body originally, have decided they want the glory for themselves. There’s a lot of talent on the screen here. River Phoenix, probably the biggest name among the kids, feels like the glue that holds the group together for most of the film, and he shows off his skills. I hadn’t realized Corey Feldman was in this, and even if I did know him well enough to recognize his face, he’s younger than when he was a big star and spends most of the movie wearing thick-rimmed glasses, so I just had a vague sense that he looked familiar. I never had a negative reaction to Wil Wheaton’s role as Wesley on Star Trek, though I later came to see how poorly he was handled. Or I thought I had. The performance he gives here shows how squandered he was on television. This is probably not a movie for children. Aside from the fact that it’s all framed as a middle-aged memoir, and the darker themes that seem improbably stacked on top of each other, I’ve never seen a film with such sympathetic child characters smoking and cursing so freely, though probably because I’ve never seen an R-rated film centered on children before this. It’s certainly a picture of boyhood in the 50s that would never have made it to the screen in the 50s. This is a dialogue-heavy story, and the child characters behave and talk believably like children (aside from the degree of cursing, in my experience, though I was rather sheltered), about very grown-up problems. The darkness of the subject matter was difficult to face, but it was ultimately handled skillfully and believably, though I’m a bit tired of the “you’re a special writer and you need to use your gift to get far away from this awful place” theme that gets applied to Gordie. It probably wasn’t as tired of a trope in the mid-80s as it is now, but I think it was hardly original. I didn’t enjoy most of this film, except for a few bright spots, until somewhere near the end where changes in the characters started to become evident. Much like the story, the end is what gives the slog meaning. Much like the adventure, it’s more fun to recall than to experience. Brilliant movie – one of my all time faves. Love the soundtrack too!